Jessie is an interesting character in that I can both relate to her and not. I don’t know what I’d do if I lost my mother, and I’m a heck of a lot older than she is. Also, I’m not alone in that I have lots of family around me. But that thought of but what if can really haunt you. I know losing her will wreck me but I also have no idea what it’s like to be so horribly alone. Jessie’s mother, Eden, is a whole other story. She had everything and lost it all due to her insatiable quest for one singular thing. And while I understand her feelings on the subject, I’m not sure I would have gone to the lengths she did. I loved the alternating points of view between Jessie in the present and Eden in the past and the twisty route they took to meet in the end. The two combined voices really keep you off balance as Jessie searches for her true identity. Did her mother do the unthinkable or is there simply some mistake at Social Security? What is the truth and how does she find it? Add into this Jessie’s long-held desire to know her father and the days and days she’s gone without sleep and you’re on a slippery slope of craziness. The thing you may be hearing a lot about, however, is the twist at the end. At first, I was angry. But now that I’ve let it sit for a week or so, I’m finding myself of two minds about this. On one hand, it’s brilliant. It resolves everything and nothing at the same time. Suddenly, every insane bit of the story makes sense. And yet, it’s a bit of a cop out in the sense that everything that happened was pointless. I may never really know how I feel about this book. What I can tell you is that, even if you hate that last ten percent, the other ninety is definitley worth the read. 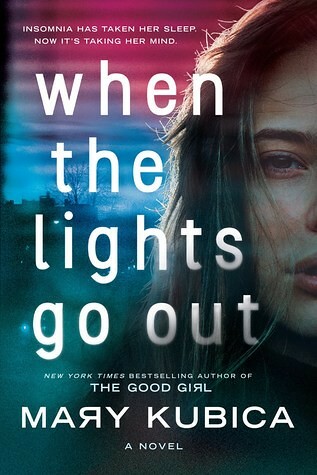 When the Lights go Out is an intense roller coaster ride of epic proportions. It starts a little slowly but, once Jessie gets the call from the financial aid office at school, it really takes off in a rush of events and chaos. You never know what Jessie is going to say, do, or discover next. I found myself unable to stop reading simply becuase I needed to know what is the truth? *This was part of my personal collection although I won an ARC from Goodreads, so thanks to them, the author, and the publisher for the giveaway.